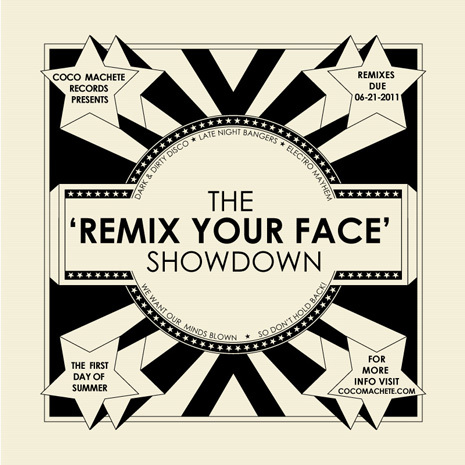 The ‘Remix Your Face’ Showdown! A Competition to Bring Down The Walls!!! boundries of modern club bangers one step beyond. passes from three different NYC Rappers; Hazel, D’ Secret SVC & D’ Boldiss. You can use as much or as little of the vocals as you like and you don’t have to stick to the original song structure at all…We want you to go wild & We want our minds blown, so don’t hold back ! The winners will be chosen by the end of the month by the Coco Machete A&R team, but your friend/fan support is important and counts as well. One winner from each title will be chosen for a future E.P. on Coco Machete. Now quick muckin’ about and show us what you’ve got!!! You are currently browsing the archives for the Remix Contest category.